Dutch defender Bruno Martins Indi has said he is contemplating leaving Stoke City as he looks for a quick return to the Premier League. The 27-year-old is two years into a five-year deal with the Potters, who will spend a second season in the Championship in 2019-20. "I have ambitions to go to my top level again," he told BBC Radio Stoke. "That's still my dream. Hopefully that will be as soon as possible with Stoke, if not I need to look somewhere else." Martins Indi, who won the last of his 34 Netherlands caps in September 2017, has featured 40 times this term for a Stoke side that has has struggled since relegation from the Premier League last season. "It's not been the season that anyone wanted," the former Feyenoord and Porto defender said. "As a player I've played my part in that, it is not even the best season for me." 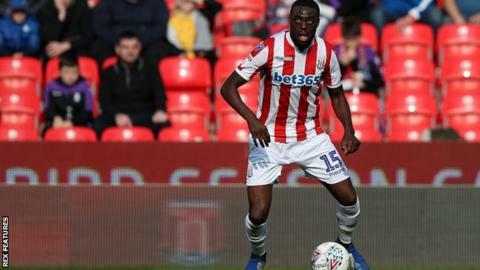 However, Martins Indi says Stoke have begun to rebuild under manager Nathan Jones, who replaced Gary Rowett in January when the side were 14th. While the Potters have lost just once in their past 11 matches, they have only managed two wins and collected 14 points from a possible 33 during that run. "He (Jones) came into a team that was very disappointed and from that moment to now we are all building a new environment," Martins Indi added. "He has played a big part in that and hopefully that will be enough to bring Stoke back to the Premier League."